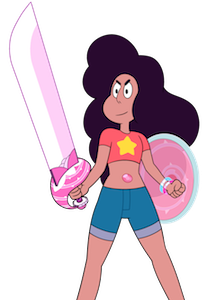 Stevonnie is the fusion of Steven and Connie. As a fusion, they do not have a single, distinct personality, but instead have a blend of both Connie and Steven’s minds, and they frequently alternate in their control of Stevonnie’s behavior and thoughts. They carry the free spirit, friendliness, and fun-loving attitude of Steven and the courtesy, awkwardness, and intelligence of Connie.